At left is a copy of a letter that I sent home with your children today. 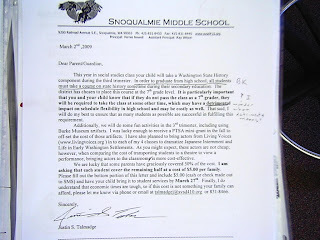 The letter explains about the high school credit received for passing Washington State History during 3rd trimester. In addition, the letter requests help in paying for some actors from Living Voices that will perform in class. Last year we had one performance that was quite good. This year I've added a second performance. On another note, how are your stocks faring in our stock market game? I have extended the end date to March 31st, which is the new end of trimester date. There is still time for you to sign up if you haven't done so. Just click on the green button in the right hand sidebar. Finally, this Friday (3/6) is the last progress report before the trimester ends. That evening you'll be able to get an up to date idea of how your child is doing so that you can check in with them over the weekend.